Finished: 2018, by a member of the MMQG. The Minneapolis Modern Quilt Guild had a block swap for these “hot crossed nine patch” blocks where you made a number of them all the same and swapped them with others so you could make a scrappy quilt with minimal investment in time or variety of fabrics. I finished the top not too long after the swap but then it sat for a few years. I designed the layout so that almost no blocks were flush with other blocks so that the tiny stripe wouldn’t have to line up from block to block. 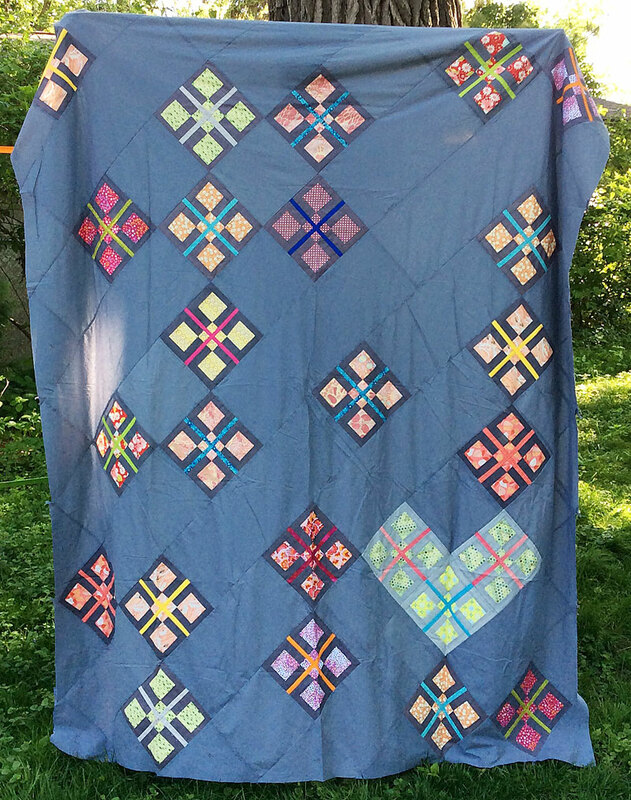 In 2018 I decided that I was never going to love it and donated the top, backing, and binding to the Minneapolis Modern Quilt Guild charity committee where a volunteer quilted and bound it before it was donated to a local charity.